This post contains spoilers for Glass, Unbreakable, and Split. In M. Night Shyamalan's Split, Unbreakable was the twist. In the last minutes, after James McAvoy's The Beast goes on a rampage, leaving all but one of the teen girls he kidnapped dead, Shyamalan reveals that it exists in the same universe as his 2000 dark superhero movie. Because there's Bruce Willis as the super-strong David Dunn, drinking coffee and reminding some diner patrons about a man known as Mr. Glass. So, for Glass -- his conclusion to the trilogy -- the connection between these characters is a given. Still, Night, a king of twists, has some tricks up his sleeve that cement the relationships between these seemingly unrelated works. Unbreakable, Shyamalan's follow up to his juggernaut The Sixth Sense, received mixed reviews upon release, but has garnered more respect over time. (It wasn't a total box office bomb, but it failed to reach the nearly unattainable heights of its predecessor.) It's a slow movie with more psychological drama than action: David is a security guard with a failing marriage when he ends up being, miraculously, the only survivor of a devastating train crash. This puts him on the radar of Elijah Price (Samuel L. Jackson), an eccentric man with a disorder that makes his bones susceptible to breaking. Teased by his peers as a child -- and called "Mr. Glass" -- he retreated into a world of comic books and became convinced that there were people out there who were as physically strong as he was physically weak. What follows is David's slow awakening, culminating in his acceptance of the fact that he does in fact have powers, only to be greeted with the revelation that Elijah was the bad guy all along. In his effort to suss out the world's gifted people, Elijah became a terrorist mastermind, orchestrating the train crash and other attacks. 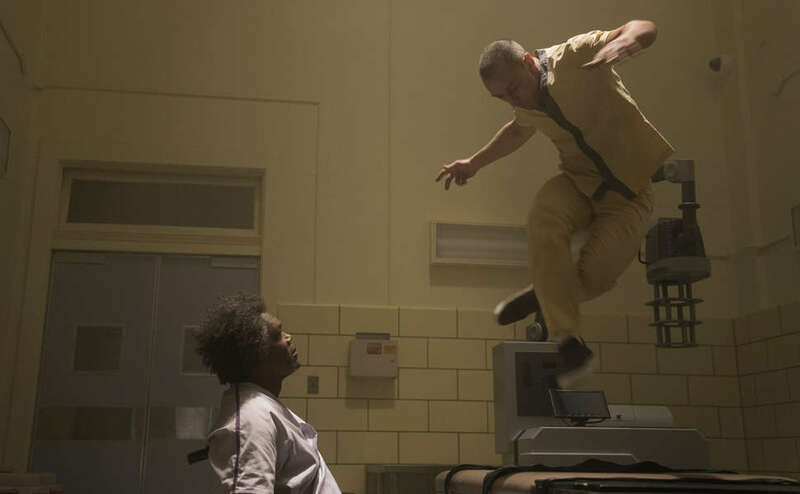 Whereas Unbreakable is slow and dark, Split is kinetic, matching the multiple personalities exhibited by McAvoy's The Horde, who suffers from dissociative identity disorder. Behind the various personas -- including a fastidious British lady, a nine-year-old, and a fashion designer -- he's just Kevin Wendell Crumb, a man reeling from the abuse inflicted on him by his mother. Unfortunately, sometimes Kevin transforms into The Beast. In that form his biceps ripple, he has a taste for human flesh, he can walk on walls, and crush people with his grasp. The rest of the people inside of him (The Horde) battle internally about whether The Beast should live, in the parlance of the series, "in the light." But David and Kevin aren't just connected based on their abilities. Throughout the film, Shyamalan teases a mysterious detail about Kevin's father, something that David's son Joseph (Spencer Treat Clark) stumbles upon in research. (Googling is so simple, and yet so few cinematic characters choose to do it.) The younger Dunn finally announces his discovery during the climactic showdown between the three principal characters in the parking lot of the facility where they were being held. It turns out Kevin's father, Clarence, was on the same train as David. Like the other misfortunate passengers, Clarence died, leaving Kevin alone with his cruel mother, whose vicious treatment is what led Kevin to develop his multiple personalities. That means Mr. Glass can claim to have created The Beast, which he does as he watches his grand plan unfold. He takes pride in this, but it's also his undoing: The Beast delivers fatal blows to Elijah, who crumples. It's a revival and deepening of one of the most controversial and undercooked threads Shyamalan introduced in Split: That trauma produces powers. It's also a convenient way to tie everything together just a little more fully. If that's the strongest link between all three movies, there's another one that's positively silly. It has to do with Shyamalan himself. The director is famous for making cameos in nearly all of his films, and in Unbreakable he plays a drug dealer lurking around the football stadium where David works. In Split, he's Jai, the guard at the apartment belonging to Kevin's ill-fated therapist (Betty Buckley). Turns out: That was the same guy. As a cover for heroics, the Dunns run a security business where Shyamalan's Jai stops to get some equipment. He recognizes David, and not because he thinks he's the mysterious figure being called "The Overseer." No, it's because he used to hang around Franklin Field with his "shady" buddies. He "turned it around," though, he says. "Positive thinking." That the drug dealer reformed his life and became a guard was a joke Shyamalan and company told on the Split set, and it made its way into the Glass script. The evolution of Glass is a peculiar one, and it yielded a peculiar movie. Shyamalan initially conceived of The Horde as a villain for Unbreakable, and whether or not he always wanted him to be a product of the same disaster that was David Dunn's awakening, it fits with the tragic messaging. In the Glass universe, being a real-life comic book character doesn't mean glory, it means a legacy of isolation and sorrow.